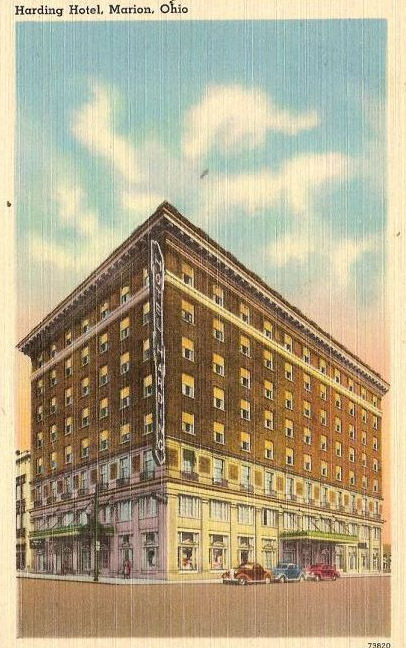 The Harding Hotel, as it appeared on a postcard in 1948. When we got down to the basement, she showed me what used to be a room for dancing and drinking, especially during the Prohibition era. Part of the old bar was even still leaning against the wall. Another room she showed me was full of old pieces left over from when the hotel was renovated back in the ’90s: pieces from the cornice molding, ornate iron railing and light fixtures. It was when we headed up to the third floor, however, that she told me her strangest ghost story. To read the rest of the story, pick up a copy of Haunted Marion, Ohio! We have the old bar from the Harding Hotel in our basement and would like a little history on it. We were told that the bar where it was located in the basement was a place of prostitution…. I work very closely with the owners of the Harding Hotel. Do you still have the bar you mentioned? In the 1920s my grandfather, William Roy Pinyard, managed the restaurant in the Harding Hotel. Does anyone know where I might find more information about that period? My grandfather was the opening chef for the hotel and my father, who was practically raised at the hotel (and even lived there for awhile), became their second chef after grandpa resigned in the 50s. My father is still alive. What do you need to know? No, they did not, but Dad said there was a lot of “hanky-panky” that went on down there. Unfortunately, he took all of those secrets with him to his grave. A true gentleman to the end! My great grandfather, Ora Stevens, worked at the hotel. He was the man in the shed for the old parking lot over on Church St. in the late 1960s. Remember playing in the hotel lobby back when it was beautiful and fancy.